How Far Will Nickelodeon Take Its Sports Identity? NEW YORK, NY—MARCH 7, 2016: Is Nickelodeon carving out a new hybrid major league sports-entertainment genre for itself? Others have made efforts in this arena, but none on a platform as wide as Nick’s. Nick went through a long dry spell as far as developing new, licensable IP. Not for lack of trying, but it isn’t an easy (or scientific, no matter how much testing) process. NBA star Carmelo Anthony, aka Melo, is behind an exclusive-to-Macy’s TMNT x Melo fashion line built around the Teenage Mutant Ninja Turtles. Joint licensing of sports and entertainment isn’t a new idea, but TMNT x Melo carries the concept several steps beyond the usual Warner Bros. or classic Disney characters on jerseys, teddy bears, and bobbleheads. Success will breed plenty of imitators; that’s inevitable. But Nick can use a concept that has built-in renewability; its mix of sports and entertainment can expand with new athletes and be applied to new hit properties as they emerge. It’s 17 years since SpongeBob SquarePants debuted on Nickelodeon. Sixteen years since the first Dora the Explorer episode. It wasn’t until 2012 that Nick revived TMNT, and 2013 that Paw Patrol began its run and that the revitalized Power Rangers re-emerged in their 20th season as Power Rangers Megaforce. From a licensing perspective, that left Nick with a more than decade-long lull where, because there was no new breakthrough animated IP, the network’s consumer products division had to do its best reinventing SpongeBob and Dora to carry it. Warner Bros. has faced similar issues over the years, with DC Comics (Batman, especially, but Superman as well — even in non-movie years), Looney Tunes, Tom & Jerry (at least outside the U.S.) and other classics tiding them over. “Cross-licensing, primarily involving character/entertainment properties along with leagues, teams, and/or players, has long had a presence in the sports sector,” wrote Karen Raugust last month in her excellent trend-rooted RaugustReports blog. “Going back at least to the mid-1990s, the four major U.S. leagues were partnering with classic characters such as Peanuts, Mickey and Minnie Mouse, and Looney Tunes. With few exceptions (Disney had an NHL/Phineas & Ferb deal in 2011, and there have been several crossovers in Europe), these deals are character rather than program-driven, and are often promotional rather than based on long-term consumer products campaigns. As for Nick’s current stable of properties, Paw Patrol — produced by Spin Master with Nick and Canada’s TVOKids — is the big recent new hit property and the reconstituted Turtles and Power Rangers have proven resilient as shows and on retail shelves with licensed merchandise. Whether Nick can parlay Gronkowski’s and Eaton’s live action shows into merchandise, or whether they and other athletes can be teamed, so to speak, with others from Nick’s animated stable to build on this niche, remains to be seen. Nick is well-positioned, though, to make it happen. Ira Mayer, former publisher and executive editor of The Licensing Letter, conducts competitive research and consults for marketers; takes clients on retail tours; and offers courses on licensing to corporations and at colleges and universities. You can reach him by clicking on the “Contact” button above left. NEW YORK, NY; DECEMBER 15, 2015—Sports licensing rarely has a runaway hit that moves the needle up for the entire segment the way Star Wars is doing for entertainment licensing this year (see Fearless Forecast: Entertainment Licensing). Historically, sports are more likely to face a negative impact from a strike, lockout or other labor dispute, or a public relations crisis (abusing girlfriends/wives, health issues such as concussions) than to experience a sudden surge. Sports licensing is also spread across leagues, teams, and players most of whom have more or less local followings. So an uptick from, say, a team that hasn’t won a major title in some years or a player who achieves a record in his or her sport isn’t going to have as big an impact on the segment, nationally, as a whole. All of which adds up to why sports licensing has essentially plateaued. For most leagues, teams and athletes, upsides are incremental and opportunistic. 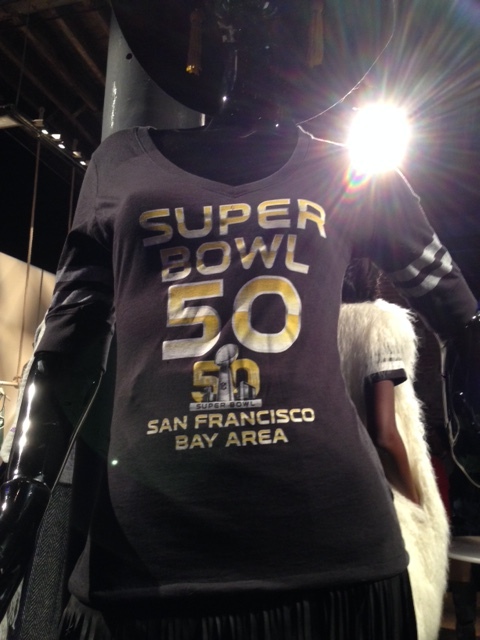 In the most extreme cases (a no-hitter, running record yardage in a single game, and so forth), the opportunism turns into a game of beating the pirates — lower case “p” intentional — who invariably seem able to be on the street with t-shirts before the game is over; this compares to licensees who will take days if not weeks to celebrate a sudden occasion. Personalization. Put your name on your favorite player’s team number and colors. Embroidery, heat transfers, and various types of instant printing are available in-store while you wait (not long) and online. The Players Associations are becoming more aggressive. Many of their efforts center on marketing tie-ins that may or may not have licensing components. 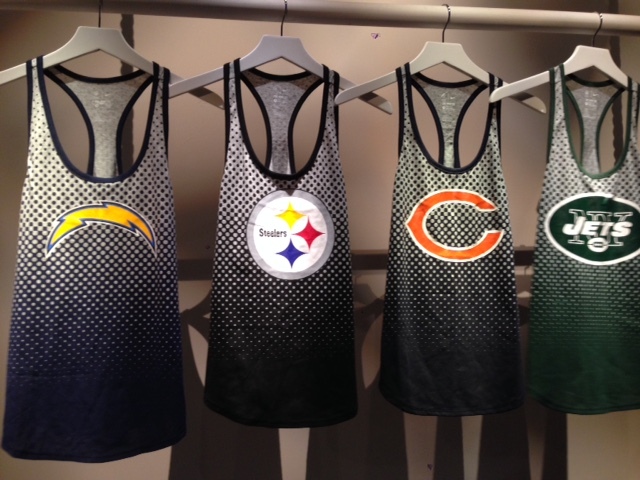 But even NFL and MLB Players Associations’ presence as exhibitors at Licensing Expo in Las Vegas this past June spoke to the higher profile they are seeking. Co-branding players using both their pro team and college insignias; PGA co-branded college, NFL, MLB , NBA and NHL golf gear; cartoon characters and leagues, and so on. Women. Alyssa Milano can’t be given enough credit for changing the attitude of the major leagues about what women will buy. 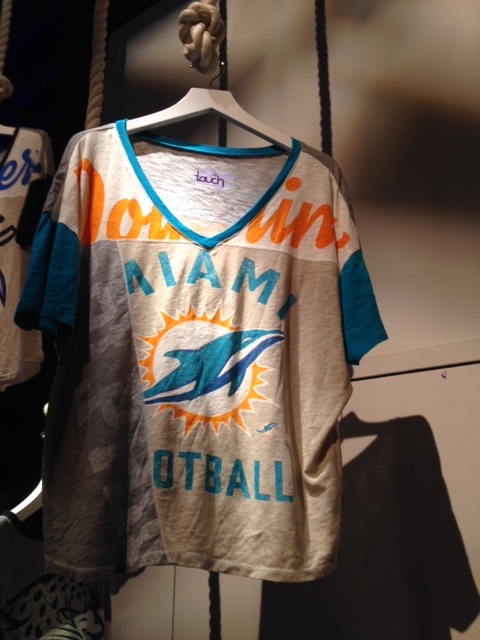 It’s not about an oversized jersey women can wear as a nightshirt. And it’s not about pink. 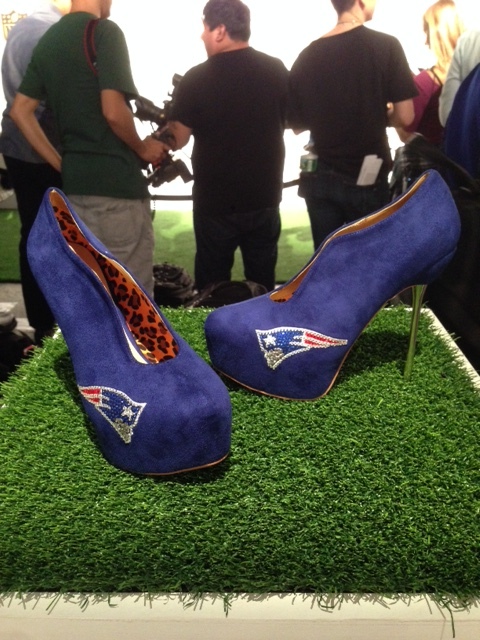 It’s about apparel designed and fitted for women, with a fashion-forward look that also appeals to the fan interest. Growth in the segment is slowing, but it still has substantial momentum. When it plateaus, it will be at a high level. Kids are the mystery ingredient for sports merchandising’s next growth spurt. For kids who play sports, the family budget is allotted to little league uniforms and gear. And its difficult to differentiate kid-oriented licensed sports merchandise in the way that women’s merchandise has achieved. Ira’s Fearless Forecast: Barring any major catastrophes, labor stoppages, health issues or morals-based PR challenges, and thanks mostly to price increases, retail sales of licensed merchandise based on sports properties will continue modest growth of 2%-3% annually for 2015 and 2016.
Who Gets The Biggest Bump In Sales Of Licensed Merchandise From A World Series Win? 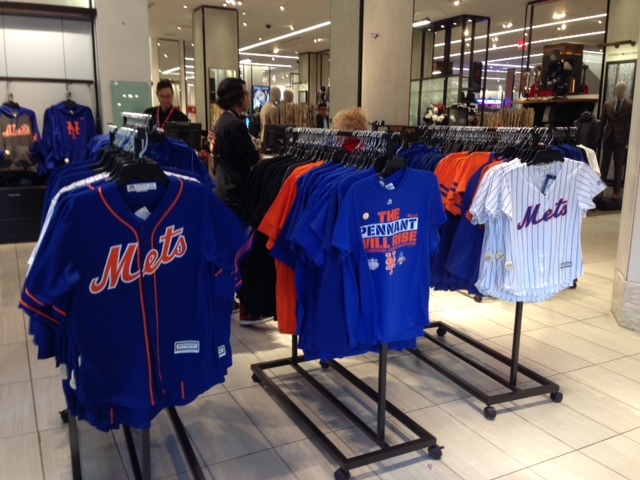 NEW YORK; October 22, 2015—Macy’s is on top of its game: The flagship Herald Square store rolled out (literally, on racks) a NY Mets display at the 7th Ave./34th Street entrance today. 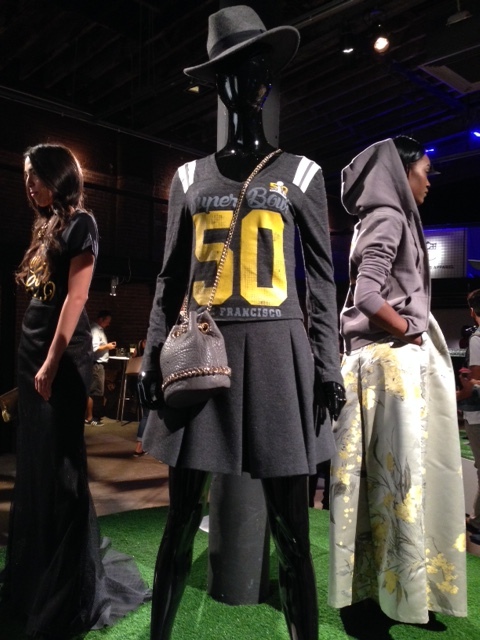 With Majestic, Nike, and Forever Collectibles t-shirts, sweatshirts, jerseys, and tote bags, it was a small array but prominent for sure. “This is all you have?” asked a woman who promptly went through the rack looking for the size she wanted. Mets merchandise following its Pennant win at the entrance to the flagship Macy’s in Herald Square. What does a Mets-Kansas City Royals or Toronto Blue Jays World Series matchup look like from a licensing perspective? This should be a good year. What licensees don’t want is the same team winning two years in a row, or even two out of three years. As with a series of movies, fans buy their World Series memorabilia in year one; the second film in a series typically doesn’t do as well as the first. That follows for sports teams. The Mets make it to the series on average every 15 years — 1969, 1986, 2000, 2015. Kansas City competed in the World Series last year, losing to the Giants, and hasn’t won a series since 1985. Toronto won back-to-back in 1992 and 1993 but haven’t been back since. So licensees are good on that count whoever wins. 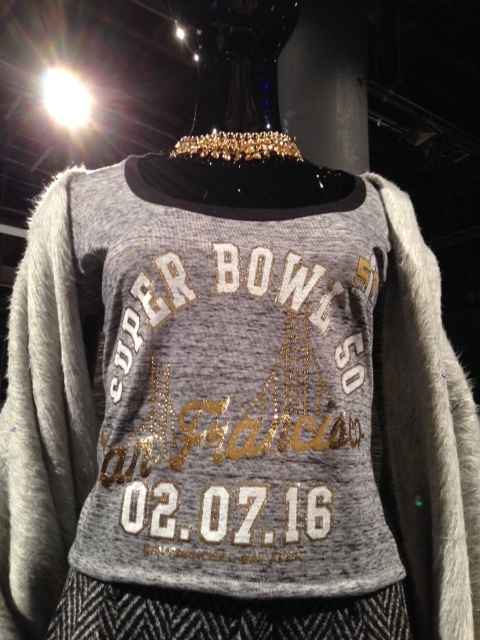 Plus, much of the merchandise during a Series is souvenir goods purchased at the venue and in local stores. 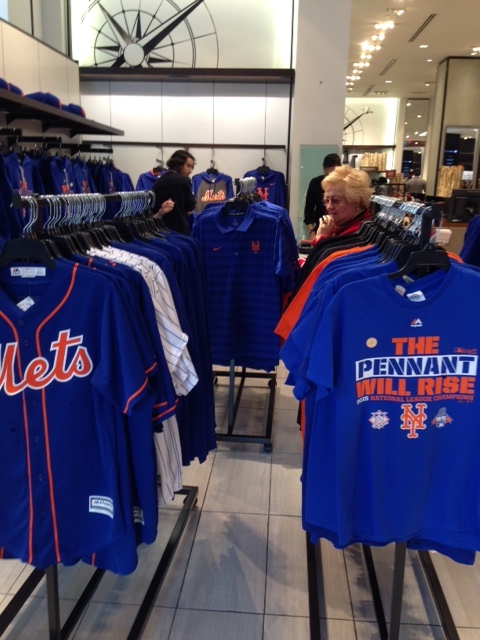 But which team in the 2015 World Series stands to see the biggest bump in merchandise sales? The Mets have a larger home market, though it’s hard to know if there are as many out-of-market fans as there are for the Yankees and the Red Sox. Still, that sizable home market means more customers for merchandise. Most telling is that there are three Mets on Major League Baseball’s list of 20 most popular jerseys of the 2015 regular season: Matt Harvey (No. 9), David Wright (No. 11), and Jacob deGrom (No. 17). For the post-season, all three will clearly gain traction, with Harvey a good bet for topping the list if the Mets take the series. Maybe even if they don’t. Toronto’s Josh Donaldson is on the list at No. 12, but there are no Royals on the MLB best-seller list at all! The irony: No. 1 on the regular season list is Kris Bryant of the Chicago Cubs. The Mets, of course, swept the Pennant series…from the Cubs. Sidenote: The first jersey you see in the Macy’s Locker Room by Lids shop on the fourth floor is a woman’s Derek Jeter “team captain” model from Majestic. There’s very little Mets merchandise up there — it probably got moved to that high-profile location on the main floor, prompting one customer to be sent downstairs to find what he wanted.